Police forces walk near a tram at the 24 Oktoberplein in Utrecht, Netherlands, where a shooting took place on March 18. A horrific attack in Utrecht, Netherlands, on Monday left three dead and five injured. Following a citywide manhunt, police arrested the suspect, 37-year-old Gokmen Tanis, eight hours after the shooting. A second individual has also been arrested in connection to the shooter. 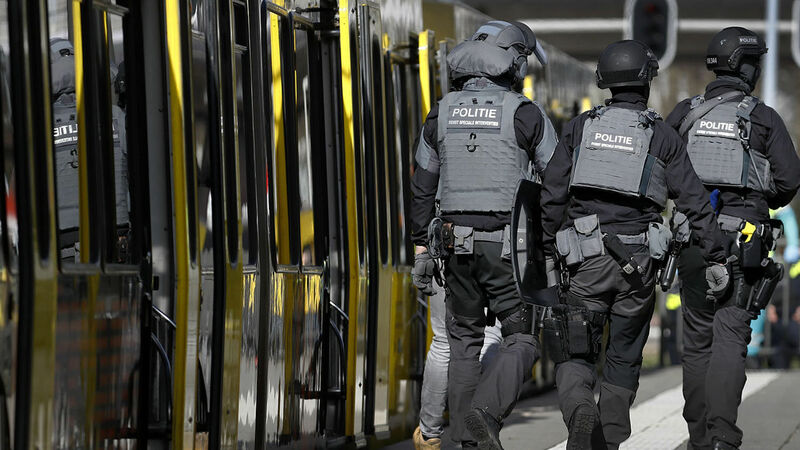 The attack occurred on a tram at the city’s 24 Oktoberplein tram stop, and security cameras recorded footage of the shooter moments before the attack happened. The Turkish-born gunman’s motives for the atrocity are still under investigation, but Dutch officials are treating it as a “possible terror” attack. Schools and other public buildings were locked down until the suspect was captured. After the arrest, Utrecht’s official terror threat level was lowered from five (the maximum) to four. This shooting in the Netherlands came on the heels of the tragedy in New Zealand. There has also been a notable rise in knife crime in Britain. The United States has been dealing with the disturbing crisis of domestic shootings for years. Why are we plagued with violence on our streets, in our schools, at our tram stations? Is it because gun laws are not tight enough? Are they too tight? Is it racism or mental illness? What is the cause? The Trumpet watches this trend closely, and we warn our readers that none of those things is the root cause. The true issue is found in the daily activities of our society as a whole! “Hear the word of the Lord, ye children of Israel: for the Lord hath a controversy with the inhabitants of the land, because there is no truth, nor mercy, nor knowledge of God in the land. By swearing, and lying, and killing, and stealing, and committing adultery, they break out, and blood toucheth blood” (Hosea 4:1-2). This is a prophecy of our modern day. Specifically, it is referring to the modern nations that are descended from ancient Israel. Notice that Holland (the Netherlands) is one of the modern locations that the descendants of ancient Israel settled. And they are still there to this day! Blood touches blood in the modern nations of Israel because of the people’s sins—because there is no true knowledge of the true God. Swearing, lying, killing, stealing, sexual promiscuity and perversion. Isn’t that a crystal-clear picture of our society? This is the real cause of the violence in our nations. No gun laws can fix it. Israel has “sown the wind” in their sins, and they now “reap the whirlwind” in the violence and other curses they suffer (Hosea 8:7). Despite the terrible state that Israel is in, there is hope for our people, and it is also found in the book of Hosea. The secret to fixing the problems in our society and eradicating the violence that afflicts us is to turn back to God! God admonishes us to rely on Him for help: “[T]here is no savior beside me. … O Israel, thou hast destroyed thyself; but in me is thine help” (Hosea 13:4, 9). The punishment God allows Israel to suffer is nothing more than correction. Just like a parent tells a child not to run into a road full of dangerous, oncoming traffic, God tells us to come out of our sins! Sin hurts—it leads to death (Romans 6:23), just like running into an oncoming car would lead to death. God’s correction is given in love. Once the people of Israel change from their current ways and return to God, then He can bless them and remove the suffering that plagues them because of their sins. God says that He will “heal their backsliding” once they finally turn back to Him. God is going to renew His tenderness for Britain and all of Israel. Britain will have learned its spiritual lessons so deeply that God will restore its former glory. Only this time, the glory will be far greater because the people will be full of the knowledge of God. They will show forth the fruits of God’s Spirit. Horrific, unnecessary violence, like the shooting in Utrecht, will be a thing of the past once Israel—and the whole world—turns to God in sincere, heartfelt repentance. An inspiring truth is that the same principle applies in our own individual lives. To have such peace and godly protection in your life now, turn your attitude and actions wholeheartedly to God! That is the lesson He wants us to learn. To understand this subject more deeply, request a free copy of Mr. Flurry’s booklet Hosea—Reaping the Whirlwind. You can also request Mr. Armstrong’s free book The United States and Britain in Prophecy for a clear understanding of the modern identities of the nations of Israel.